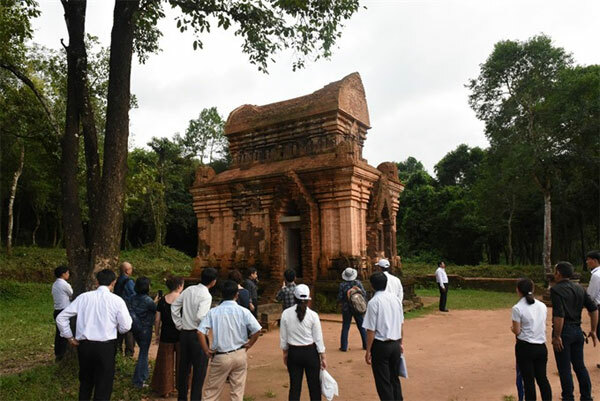 VietNamNet Bridge – The restoration of ancient towers at My Son Sanctuary has embarked on a new stage, helping preserve the relics while at the same time keeping their original value intact, experts have said. Ancient structure: Visitors admiring tower E7 at My Son Sanctuary. "Restoration makes the relics more sustainable. It does not change their original value but makes it clearer. 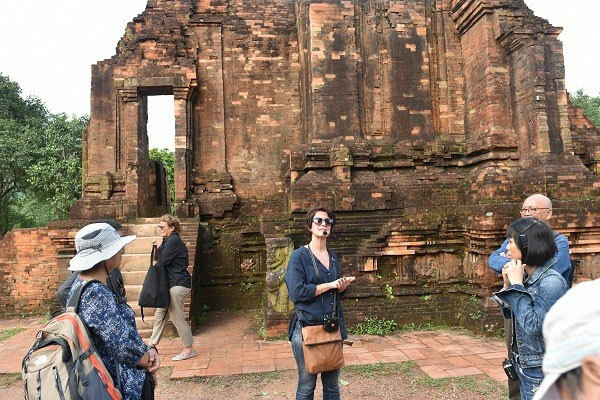 Through the restoration work, people can understand the precious value of the heritage that our forefathers have left to us," Ho told Dân Trí online newspaper. Architect Hoang Dao Cuong, deputy director of the Relic Conservation Institute at the Ministry of Culture, Sports and Tourism, said in his report after the workshop that the work on tower E7 and tower group G in My Son had provided useful information for the restoration of other Cham towers across Vietnam. "With the relics’ outstanding values of culture and history in general, and architecture and art in particular; with conservation undertaken with technical conditions in the form of architectural and archeological ruins; with current financial and technical considerations, at the same time based on modern ideas, we can only choose one orientation suitable for the restoration of Cham towers in My Son as well as others towers in central Vietnam, that is: restoration for conservation and maintenance," Cuong told Việt Nam News. Important work: One of the Italian experts examines materials used to restore the Cham towers in My Son. 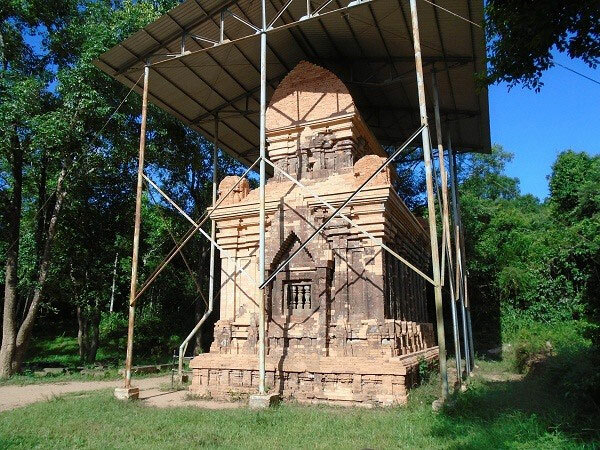 Conservation work includes two main concepts – consolidation, or the strengthening of existing structures, and anastylosis, or the reconstruction of ruined monuments in an archeologically-responsible way, according to Cuong. The architect clarified the technical solutions employed for the restoration of the Cham towers, saying that consolidation would increase the load-bearing capacity of structures which had suffered from landslides and cracks. In modern restoration, Cuong said, consolidation could use modern materials such as cement and steel to support the structure of the relic. "Consolidation helps save the relic from collapse without replacing its original components, while anastylosis is understood as a rearrangement of the original components of the relic that have shifted or collapsed,” said Cuong in his report. Cuong revealed that the remains of the Cham towers were currently strewn around the site. Some had been broken or deformed, so they had to be gathered and identified before they could be returned to their original shape and position. The restoration of the brick structures was undertaken to retain the original shape, leaving the possibility of full recovery for later generations when conditions were right to do so, he added. In addition, during anastylosis, repositioned blocks would not alter the old construction techniques, the architect said. Many temples in My Son had been restored by the methods of consolidation and anastylosis, according to Cuong. “These principles and technical solutions have made a contribution to preserving the Cham architectural heritage around the country, and also helping make the Cham towers in My Son a World Cultural Heritage,” said Cuong. Restoration: Researchers working near tower G.
Starting in 1898 with the discovery of the complex by M.C Paris, a group of French scientists led by Henri Parmentier worked with Charles Carpeaux at the French École Française d’Extrême-Orient (EFEO) on a project to explore and document the relics from February 3, 1904. The architectural works were scattered across a valley roughly 2km wide between two mountain ranges. The archeologists concentrated on the western area, where a large number of pieces were gathered first, before the scientists started work on groups A, E, and F.
The research work was interrupted until 1980 when the Viet Nam-Poland Bilateral Restoring Project led by Kazimierz Kwiatkowski began. Polish archeologist Kwiatkowski worked with a group including architects, construction engineers, photogrammetry experts and archeologists. Vietnamese researchers were led by architect Hoang Dao Kinh. A UNESCO-Viet Nam- Italy co-operation project underwent three phases of restoration from 2003. The project contributed to reinforcing the relics and reshaping the G temple group, simultaneously finding alternative materials for the restoration of the Cham towers in general. Italian experts surveyed and assessed various influences on the status of the relics, including those of geophysical, geological and hydrological conditions. 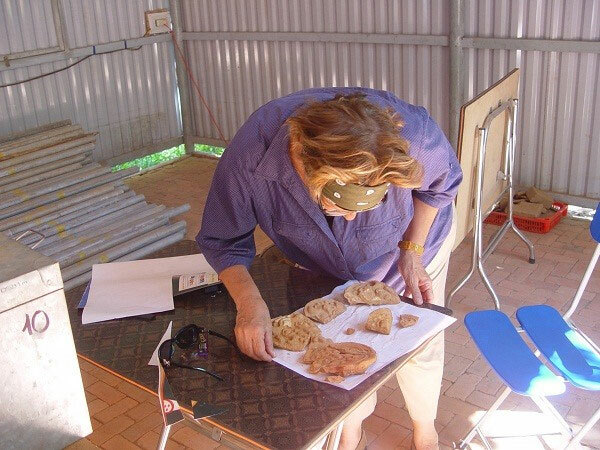 They also conducted special research and discovered bricks, adhesives and original construction techniques available for the restoration. Based on such research, the Government of Italy provided funding, under the auspices of UNESCO, to continue the implementation of a project on protecting the World Heritage of My Son. In addition to conducting archaeological research and excavation on an area of more than 1,800 square metres, more than 3,000 archaeological remains and pieces of architectural debris were classified. The solutions applied in the restoration project of tower group G were a big step based on the results of scientific research demonstrated by the use of restorative bricks and adhesives of plant origin. According to Vietnamese and Italian experts, conservation and restoration methods which were used in previous phases continued to be employed. Alongside that success was research made into producing bricks that were equivalent to ancient Cham ones. With Italian coodination, the Relics Museum started a project to restore tower E7 in June, 2011. This project was regarded as a practical step in applying research results on construction materials and adhesives implemented by the institute, following the joint research programme with Italian experts. The technical process and methods have been effective and archeological restoration in combination with repositioning and reinforcing work has been done on a scientific basis, according to the experts. After dozens of years of reinforcing and restoration work, many towers in My Son have returned to their original appearance and serve as a fascinating glimpse into the past. Work continues to ensure these valuable cultural relics survive for future generations.